8 men stand in front of this Mahogany Tree. 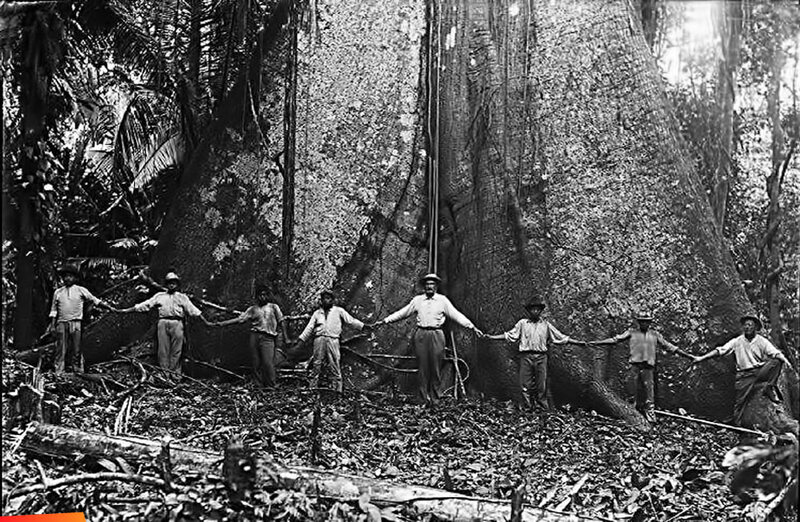 It would have taken a little over 20 men to form a full circle around this magnificent Mahogany Tree. Amazing! "How many slaves did it take to remove Mahogany trees from the rainforest of Belize?" According to Nigel Bolland the process of extracting Mahogany was so intense it took 10 to 50 slaves working in small groups to complete the task. Mahogany was the main Export of Belize for over 150 Years. Today all the BIG trees like the one in the photo are gone. No one ever bothered to plant any back for reforestation, so production has slowly dwindled. Now it’s the Rosewood that is being illegally cut and deforested. These large trees were common in Belize before 1930s, and now they are extremely rare. We note of a of Cotton Tree behind Rancho Dolores that is over 20 feet in Diameter that exists today. It is interesting to note that many mahogany kneading and washing bowls were made from the purrs of these huge trees up until the late 70's. Today mahogany wood is found in almost every home in Belize and is a choice wood for local artisans in Corozal. There currently exists in our remote areas and forests of Belize, many very large trees yet to be publicized. There are also many other such trees throughout the country of Belize. 1) Huntsmen – his job was to search and survey the forest to locate the mahogany trees. The slave owner depended on the huntsman’s skill to not only find the mahogany, but also to report the find. This was the occupation with the most freedom as the huntsman would work independently with minimal supervision. 2) Axe men – were deployed after the huntsman found the tree. This was the most dangerous and arduous job as it required the operation of a heavy axe on a platform that was 12 feet off the ground known as the “barbecue”. 3) Cattlemen – were responsible to feed and work the cattle used to hauling the huge trunks. 4) Men who received the logs at the river mouth and were responsible for squaring the wood for final shipment. 5) Cultivators – were responsible for cultivating the grounds for the production of ground foods, vegetables and other subsistence crops. 6) Women were responsible for the domestic operations of the household and they also cooked, sewed, washed and ironed. "After 1770 about 80 percent of all male slaves aged ten years or more cut timber. " 2016: Human trafficking, forced labor and other forms of slavery exist in Belize. Incidence of slave children born to white Masters are evidence of the sexual favours enslaved women were required to perform as mistresses. Children born in slavery became adopted to the life of servitude from a young age. Young boys and girls wait on tables. Girls also served as chambermaids while boys serve d as footmen. As children grew older they were moved on go more demanding occupations. In ‘Correspondence Relative to Slaves at Honduras 1820- 1823’ Superintendent George Arthur wrote a series of letters to England detailing the harsh cruelty suffered by the slaves at the hands of their masters. With no formal law in place for the protection of slaves, it wasn’t until 1821 that the King of England gave a royal proclamation that the “Consolidated Slave Law of Jamaica” should be observed in the settlement when it came to the treatment of slaves. Resistance to slavery has been recorded throughout its existence in the settlement of Belize. Slaves used both active and passive approaches to resist their enslavement. 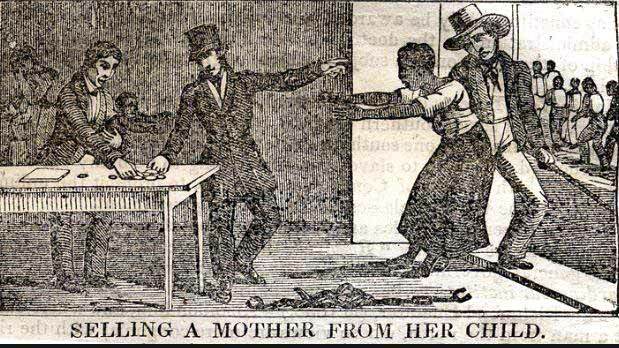 For women it was observed through actions such as abortions where women who were made pregnant by their slave master had abortions as they refused to raise a child under the conditions of slavery. Obeah was also believed to be practiced by some of the slaves against their masters and was made punishable by death in 1791. Men resisted in a more active approach which resulted in running away or revolt. The first major step on the road to emancipation was an ‘Act for the Abolishment of the Slave Trade’ in 1807. The members of the Society for the Abolishment of the Slave Trade decided to concentrate on a campaign to persuade British Parliament to prohibit trading in slaves. They felt they were more likely to succeed than if they demanded the abolition of slavery itself throughout the empire. They also believe that if the slave trade was ceased, slavery would eventually be brought to an end. 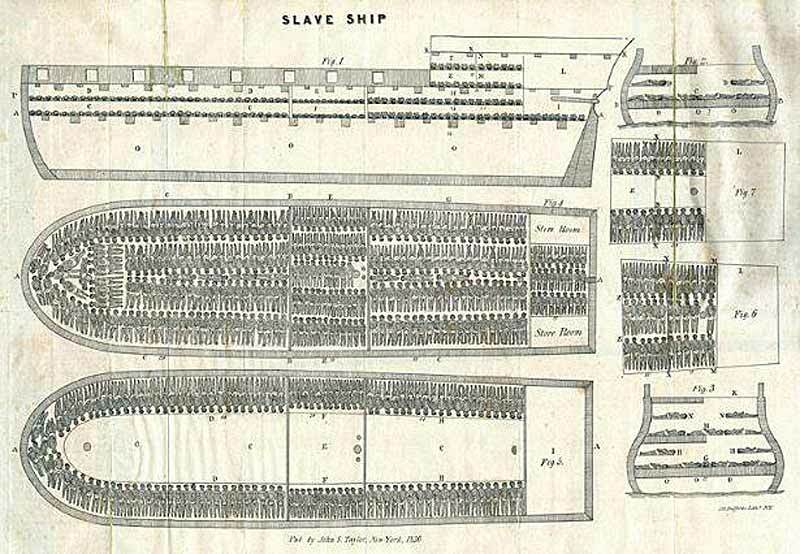 On 25th March, 1807, the Act for the Abolition of the slave trade made it illegal to carry enslaved people on British Ships. 1) The education campaign laid by the abolitionists. 2) Major slave revolts in Jamaica, Demerara and Barbados. 3) Reduced demand for slave-based goods. 4) The Reform Act of British Parliament in 1832. As of August 1st, 1834, slavery was officially brought to an end pending a transition period known as Apprenticeship. In British Honduras, the end of the apprenticeship period on its eve of July 31st, 1838, was marked with prayer and mild celebration. In places like Jamaica, the end of slavery was symbolized by burying a coffin containing a whip and chain inside. 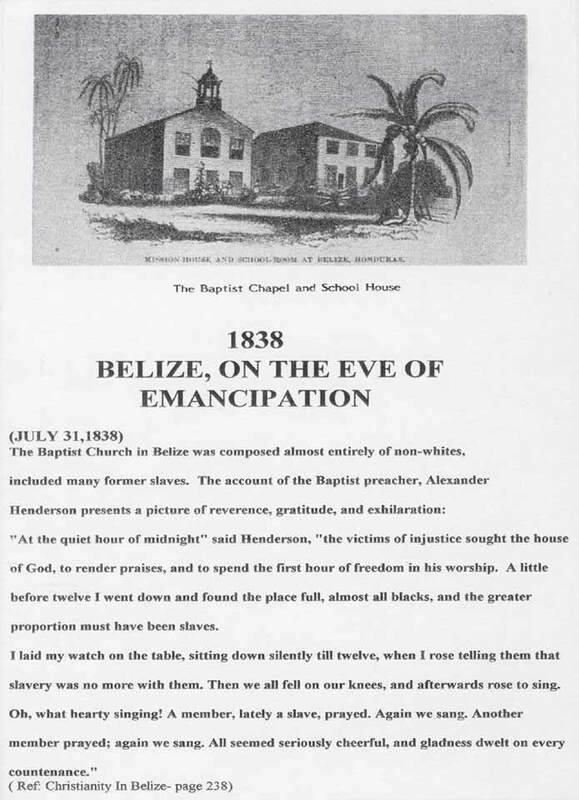 The Superintendent of Belize reported that after most of the ex-slaves were carrying on with their own activities. 1) Only white men could own land and former slaves could not. 2) Land was to be sold at one pound per acre, which was too expensive for the ex-slaves. 3) The British Woodcutters developed the ‘advance system’ where advances were given under a strict contract system. This ensured the ex-slaves were bound to the employer for six to twelve months. 4) The ‘Truck System’ where the ex-slave had to take a portion of their wages as provisions from their employers store. The First step towards emancipation was the registering of all slaves in the settlement before August 1834. Order-in-Council reached Belize in March 1834 and established a registration period of two months. In order to compensate slaves’ owners for their loss they would incur once the slaves were free, Britain paid 20 million pounds today. This was equal to roughly 40% of the national budget at the time and about 1.34 billion pounds today; on the other hand the slaves received nothing. Instead the final emancipation would be reached over a period of six years which was later shortened to four years. 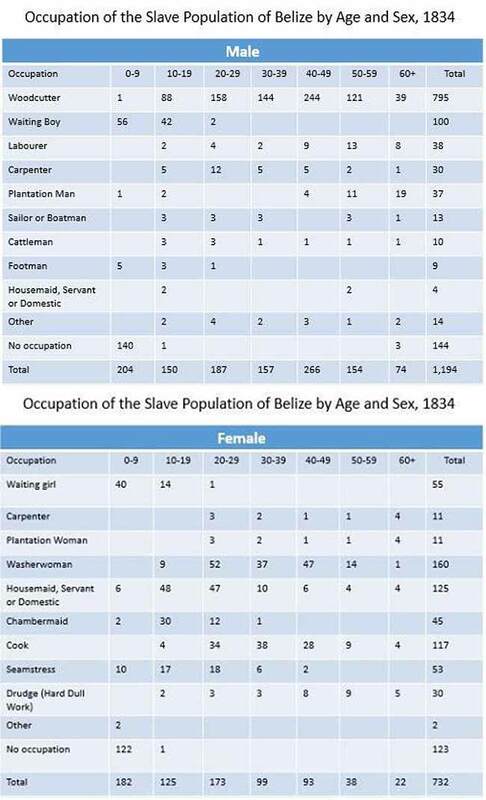 In Belize slave owners were paid an average of 54 pounds per enslaved person. In British Honduras, the period of apprenticeship was generally free of disturbances and revolts. While little seem to have changed in terms of labour control there were new power relations between the master and the slaves. Matters regarding punishment and other disciplinary actions were not dealt with until after emancipation. A special magistrate was appointed to each colony to oversee relations and enforce that the slaves were working a required 45 hours per week. The end of the apprenticeship period came early since it was found that abuse and ill-treatment of enslaved people had gotten worse. Just as other British territories within the Caribbean, Belize had its own major slave revolts/rebellions within its slavery era. The largest recorded revolt in Belize occurred in May 1773, when slaves overtook (5) logging camps and killed six British men. This revolt was only suppressed with the assistance of the British Naval force from Jamaica five (5) months after commencing. Eventually, this revolt did not cease until November of the same year. "Coloured Subjects of Free Condition"
The British system of slavery was historically the most oppressive when compared to the French and the Spanish. The French Code Noir offered freedom in various forms and education. All this were unheard of in British colonies. The Code Noir granted that: a free, unmarried man should have relations with a slave owned by him, he should then be married to the slave concubine, thus freeing her and any resulting child from slavery." Slave masters 20 years of age years without parental permission may free their slaves. Slaves who were declared to be sole legatees by their masters, or named as executors of their wills, or tutors of their children, should be held and considered as freed slaves. Freed slaves were French subjects, even if born elsewhere. Freed slaves had the same rights as French colonial subjects." So the 'good times' friendship perpetuates a lie on the Belize flag, the only flag on the planet with people on it. 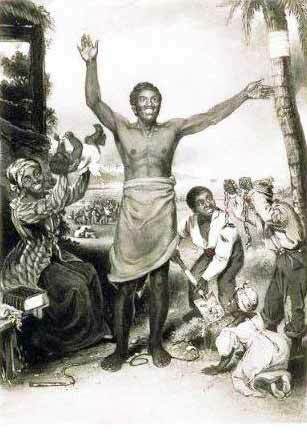 1st August, 1834 marked the Abolition of Slavery in British Dominions. 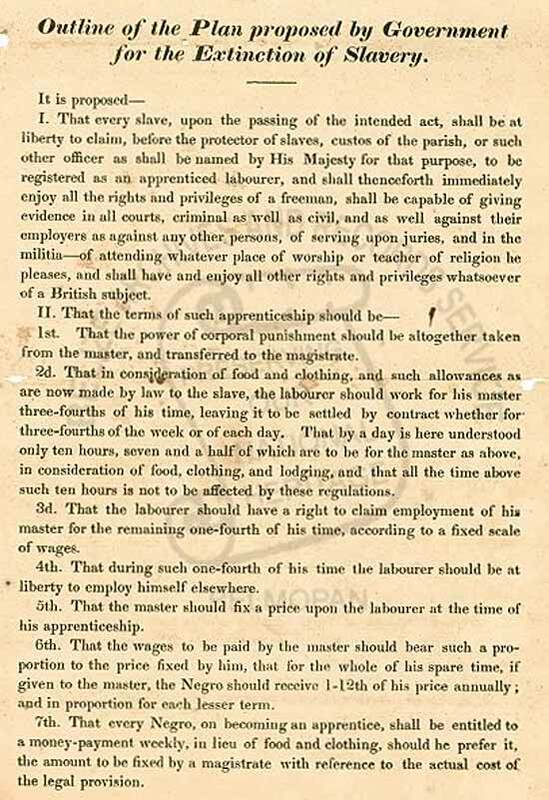 Although slavery was abolished, the date saw the commencement of the transitional period of Apprenticeship which many argue was just another form of slavery. Emancipation came four years later when apprenticeship came to an end and all slaves were truly considered free agents. 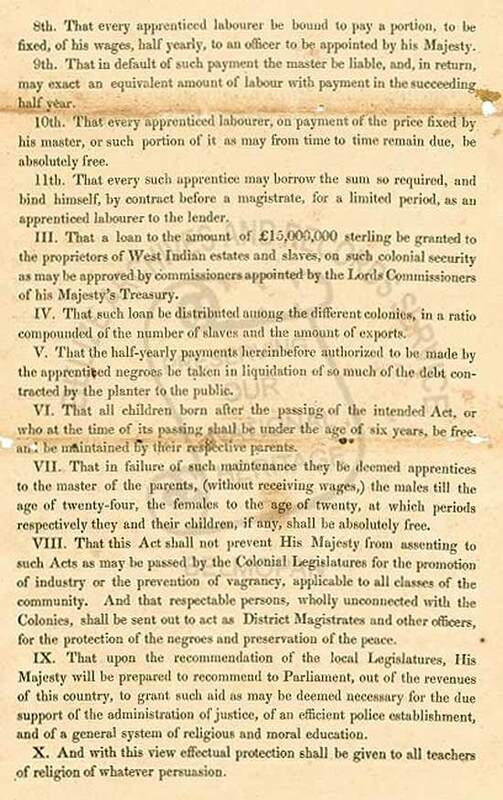 The following is extracted from a letter written by Lord Stanley and dated 20th May, 1833 "Copy of the Resolution moved by me, on the part of His Majesty's Government in the House of Commons on the 14th instant for laying the groundwork of a Bill for the Extinction of Slavery through His Majesty's Dominions." The British army was the biggest purchaser of slaves. These men formed and served in the West India Regiment. In the late 1790s, Britain was defending several of its territories around the world and they were stretched thin. Between the years of 1775 and 1783, there was the American War of Independence, Anglo French War, Anglo Spanish War and the 4th Anglo Dutch War. Britain was having difficulty in the Caribbean as well. Many of the infantry men that were shipped from Britain had not adjusted well to the climate and were dying from heat exhaustion and deceases like yellow fever. The high mortality of troops led that army to form the West India Regiments in Jamaica in 1795, just prior to the Battle of St. George’s Caye. From there, they were deployed to various parts of the Caribbean. There were several regiments formed. Members of the regiments 1st through 6th were garrisoned in St. George’s Caye. These were comprised of white officers while the infantry was comprised of black slaves that were purchased for that specific purpose. Between 1795 and 1807, estimates suggest that some 13,400 slaves were purchased for the West India Regiments. The British bought 7% of the total slaves that were sold in the West Indies. Africans and Creoles were bought from sugar plantations and from ships arriving from Angola and the Congo. This was a strategy that not only the British used to make their armies larger and to cover more territory, but also one that North Americans later adapted and which was immortalized in the song “Buffalo Soldiers” by the famous reggae singer, Bob Marley. The West India Regiments were disbanded, but subsequently reassembled in the early 1800s. Some were shifted from one regiment to form another. Slavery was abolished in 1833, therefore black soldiers recruited were now free, but remained serving in their regiments. After emancipation, West India Regiment recruits included men liberated from illegal slave ships, as well as black soldiers captured from enemy French and Dutch colonies. Now free men soldiers were given the same rights as white soldiers. Significantly, they were also formally recognized as a part of the British Army. The West India Regiment did get a change in the uniform, as Queen Victoria was impressed by the exotic appearance of the French North African Zouave Infantry, and so they adapted the style that would remain until 1914, when all British Army uniforms were standardized. There were many battles throughout the 1800s and the West India Regiment also participated in the historic World War I, which began in 1914. “In August 1813, for instance, a slave, Lizzy, was brought before a Summary Court accused of acting with 'insolence and bad conduct' to her mistress Elizabeth Potts. Lizzy was found guilty and sentenced to be lashed 100 times on her bare back and then led round the town 'at the cart's tail'. In October a slave found guilty of stealing was sentenced to 250 lashes and then to be dragged round the town.” In his speech “How to make a slave”, Willie Lynch argued that punishing an enslaved African in a public space was important. In some ways, he was saying that the idea of punishment and control is more important than the act itself. He said that it was important to not kill the enslaved African because “you spoil good economics”. Slave owners in Belize played a smart move when they managed to ask for an exaggerated compensation to free our African ancestors. They got half of it approved and still got more than many others in region. “In order to compensate slave owners for “their losses”, Britain paid 20 million pounds in government bonds. This was equal to roughly 40% of the national budget at the time and about 1.34 billion pounds today; on the other hand the slaves received nothing. In recent years, Belize has joined other Caribbean nations to have former enslaving countries provide REPARITIONS to advance the conditions of Afro-descendants. Manumission: The legal process by which slaves were freed before Emancipation on August 1 1838. "Sometimes this occurred when a slave purchased his freedom, but it was usually done by a master in respect of his slave woman concubine and their children. 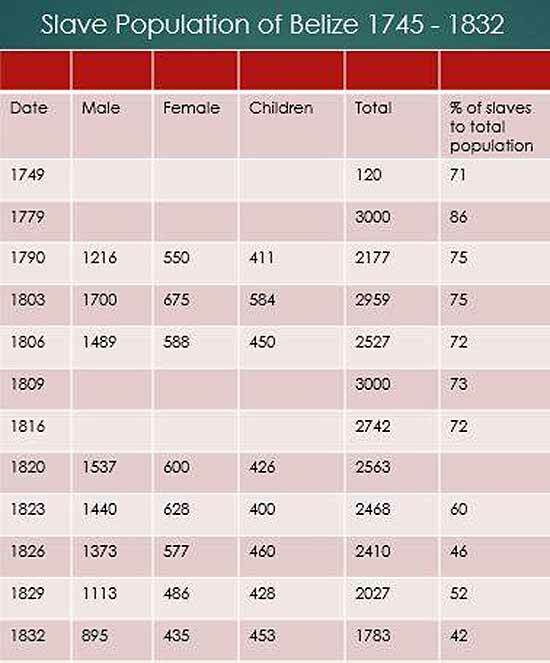 More than 500 slaves were manumitted between 1808 and 1830. This process created a group of people called "free coloured" whom the masters used as buffers between themselves and the slaves.. Some of them became slave masters, and after emancipation would, by virtue of wealth and education as well as colour, become a class that aspired to replace the Europeans as the colony's elite. The 1832 census, for example, records 31 free coloured slave owners, 17 of who were women, and 26 white slave owners." Below is an example of Manumission in 1792. Johann Jacob Sluscher frees his children Kitty Sluscher, James Dominicio Sluscher, Martha Sluscher and Matthias Sluscher at the cost of 5 Shillings. Their mother name was Venus. Africans revolted against slavery in Belize in 1765, 1768, 1773 and 1821. A settler in 1765 reported “The Negroes belonging to one Mr. Thomas Cooke of Jamaica, rebelled, killed their Master and a Carpenter robbed the house of ever thing that was valuable and fled to the woods… we do not know when it will end” (Shoman, 2000, p. 51). Three years after, they were faced with similar circumstances, a letter of 1768 reads “Matters are come to this miserable pass, that Twenty three British Negroes, Armed, had gone off from the New River to the Spaniards, and many more were expected to follow them; so that the Business of every kind was at a Stand” (Shoman, 2000, p. 51). In May 1773, a captain recorded “The Negroes before our People came up with them had taken five settlements and murthered six White Men and were join’d by several others the whole about fifty with sixteen Musquets Cutlasses, etc… ” (Shoman, 2000, p. 52). Slaves would continue to resist. Will and Sharper led a considerable number of slaves to revolt in 1821. A state of emergency was declared in the settlement. INFO: Burdon, John Alder. (1931). Archives of British Honduras, Vol. 1. London: Siifton Praed. Shoman, Assad. (1994, Revised 2000). Thirteen chapters of a history of Belize. Belize: Angelus Press.